All goats for sale are UTD on shots, dewormed and hooves trimmed. Tye Dye Acres doeling. DOB: 05/02/11 out of twins. Sire: Sandy Ridge Silkies Hemi. Dam: Mothership Farm Belle. 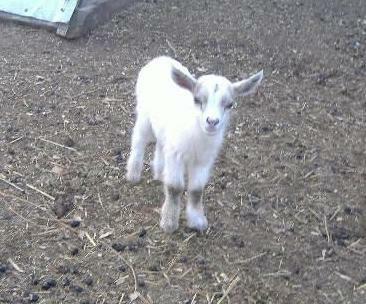 Marble blue eyed doeling, polled. For Sale. $200 or $250/pair if you take her and her sister! Tye Dye Acres doeling. DOB: 05/02/11 out of twins. Sire: Sandy Ridge Silkies Hemi. Dam: Mothership Farm Belle. 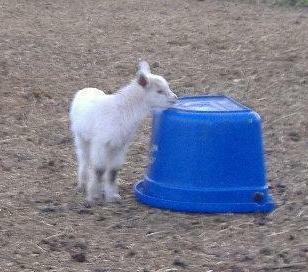 Marble blue eyed doeling, polled. Can't see it in this pic but she has a dorsal stripe. For Sale. $200 or $250/pair if you take her and her sister! I really enjoy the two wethers I got from Tye Dye Acres last year, and Lindsay was very helpful with any questions I had!~ Linda H. Madison, WI. (2009). Lindsay really cares that I am happy with the goats I got from her and is always there if I need any help. ~ Jordan K. Fond Du Lac, WI. (2009). I probably made a pest of myself with all the questions I asked, but she alway took the time to answer them!~ Kerri J. Lowell, WI. (2009). Having never owned goats before, I had only wanted one in the beginning. I visited her farm and she explained to me why goats are happier with a buddy. After seeing her goats interacting, and how they did stick together, I got two wethers from her. I am glad I went with two as they are best buddies and always stick together.~ Matt G. Fairwater, WI. (2009). Unlike some breeders who seem only to care about the money, Lindsay wants to make sure her goats go to a good home and that we enjoy them. She has helped us alot with our many questions!~ Julie B. Ripon, Wi. Our two kids from Tye Dye Acres are a joy and we are so happy to have them. They are such friendly goats and make great weedeaters! Thanks again!~ The Tillman Family, Stevens Point, WI. The fainters we got from Lindsay are such nice animals, we love them so much. They really have added to our herd and we can't wait to see their kids! Judy & Mike W. Rockford, IL. We had had goats in the past but they had horns and we ended up having to sell them because they where very pushy with their horns and our children had been getting bumped and bruised. We where delighted to find Lindsay disbuds her kids as the other breeders by us did not, and we did not want to deal with horns again. Our "kids" are wonderful with our children and we are glad we bought them! ~ Sue and Steve W. Beaver Dam, WI. I was impressed with how healthy and happy her goats are and that she tests everyone who is old enough yearly. A lot of people don't test or only do a couple, she does everyone and I feel confident about the goats I got from her. ~ Alex M. Waterloo, WI. Her prices are very reasonable and her goats are very nice and have great pedigrees. I purchased some does and a buck from her as breeding stock and am looking forwards to their kids next year. ~ Alice S. Green Lake, Wi. I bought two bred does and a doe who had already kidded. Lindsay told me if for any reason the two bred does didn't have kids or had any trouble, she would let me re-breed them to one of her bucks of my choice. Well, both the does gave me healthy, bouncy twins! I plan on using her stud service this year as I don't want a buck and she has a lot of different bloodlines. ~ Jules A. Fond Du Lac, Wi. I was paying too much for the vet to come out and do shots, deworm and hooves, and Lindsay allowed me to come over when she was doing her herd health and showed me how to properly give shots and do hooves. She let me try my hand on her goats and it really helped me a lot. Thanks again Lindsay! ~ Jim D. Columbus, Wi. It was a bit of a trip but the goats where worth it! So happy we decided to go with goats from Tye Dye Acres. All of the ones we got where up to date on their shots, and dewormed and hooves done. They are fitting in great with our little herd and just wanted to share that update!! ~ Sara L. Peoria, IL. Since I've noticed a breeder who is registering goats not from their farm under their herd name (even though the goats are from registered parents), all kids will be registered MGR before leaving. It's up to you to register them with any other registries if that applies to that kid. Please keep in mind there has been a very big slow down at the MGR and it could take up to 3 months to receive your paperwork, the delay is on their end. You can also view the Breeding Schedule page and if interested in a breeding, contact me and let me know. All kids will either be polled or disbudded. If you want a horned kid you must pay the full price in advance and it is not transferable to another kid. I strongly recommend hornless goats. Horns are dangerous and just because they are "cool" looking, isn't worth the headache of having a goat always getting its head stuck, purposely hurting other goats and/or people. Most of the pet goats that go through the sales barn have horns and are there because their owners don't want to deal with the horns anymore! I've seen children end up with black eyes and bruises from hugging their goats and accidentally getting bumped.